The Shakhtar Donetsk - Bayern Munich clash in the UEFA Champions Round of 16 will be one of those rare matches where something other than the game itself may gain precedence. The war in Ukraine that has cost thousands of lives has prompted the UEFA authorities to move the match to Lviv, almost a thousand kilometers away to the west of Donetsk, which has been the scene of intense fighting of late. Shakhtar's stadium, the Donbass Arena, has itself suffered damages from shelling and currently serves as a camp for refuges receiving humanitarian aid. With the winter recess and war depriving them of much-needed match practice, the only competitive matches the Ukrainian club has played since September 2014 are those featuring them in the Group H cluster of The UEFA Champions League. Given the difficult circumstances in which Shakhtar had to compete, it's commendable that they emerged second in the group with 9 points and proceeded to the round of sixteen. The club owes its ascension to the next round of the championship to their brilliant 27-year old Brazilian striker Luiz Adriano who with nine goals in the tournament is alongside Christiano Ronaldo as the highest scorer this season. Shakhtar is captained by the very experienced Croatian, Darijo Srna, who since his advent to the club in 2003 has made as many as 431 appearances for it and led it to countless Ukrainian titles. Brazilian talent dot Shakhtar's squad, the prominent ones being Fred, Bernard and Adriano. Leaving trivia aside or the fact that they have been the dominant side of Ukraine for over a decade, few fancy their chances against Bayern Munich in the round of 16. Apart from leading the Bundesliga, topping their Champions' League group with 15 points, the Bavarian giants will be moving in on Lviv on Tuesday in terrifying form. They were in a destructive mode on Sunday obliterating their Bundesliga opponents Hamburg SV 8-0. Double strikes from Mario Gotze, Arjen Robben and Thomas Muller suggest that Bayern have found their mojo again and announced themselves as serious contenders for European glory. The Bavarians are at the top of the Bundesliga with 52 points, 8 points clear of their nearest rivals Wolfsburg SV. From just 21 matches they have hammered in 53 goals and have been scored against only 9 times. Bayern have expressed relief at not running into Arsenal in the next stage of the Round of 16 and fancy their chances against Shakhtar. 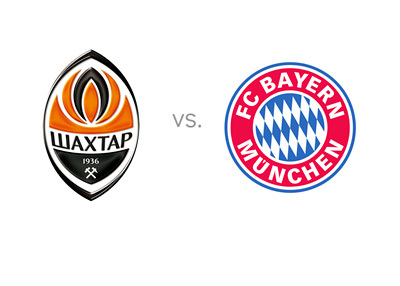 Bayern incidentally will play the Ukrainian club for the first time in an European competition. For Shakhtar, this will be their first competitive encounter in the year 2015. Pep Guardiola tempered his optimism surrounding Bayern's chances by respecting Shakhtar as tough opponents especially with someone of Adriano's goal-scoring abilities in their side. Moreover the venue of Lviv wil be somewhat on an unknown factor for the German club. Of the last 6 games Shakhtar have played, they have won 2 and drawn 3. Bayern in their last 6, have won as many as 5 and drawn once. The odds are obviously heavily stacked in favor of the German club.